It is not everyday that I get a CD for review that has an FCC warning for strong language. And doubly odd is that the track in question is followed up by “This Little Light of Mine!” So let me explain – the best I can that is. 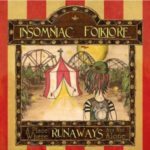 The band is Insomniac Folklore and as the name suggests their an eclectic bunch of musicians with a modern-folk twist. It’s like punk meets folk. There is a lot of what I would call “odd” on the CD, but depending on your taste, you may just find it cleaver and entertaining. I know I have grown to like it myself. I think others would call it “artistic.” Either way, it is intriguing and highly creative. Getting to the explicit warning for “In Me,” well the warning comes from the use of the slang term known as “BS.” In the lyrical context it is about building each other up and our dependence on the Lord for maturing as followers of Christ. So it goes… “BS don’t make things sharp.” Blunt but relevant. Get past that and the rest of the song is a cry out to God to break a heart of stone and darkness – a psalm like cry out to the Lord as it closes – “What can you do in me?” Another bold statement comes with “bodies and arson” where they sing, “burn down the building and let free the body.” The song speaks of the trappings of caring more for the church building than the church body. Admittedly, it took a while for me to get past the oddity of the album, but in the end that is also what makes this Gospel centered sideshow even more valuable. Step out of the comfort zone and open your ears to a tapestry of music and edifying lyrics. This entry was posted on Sunday, March 25th, 2018 at 11:00 pm and is filed under CD Review . You can follow any responses to this entry through the RSS 2.0 feed. Both comments and pings are currently closed.